When one mentions Jane Austen, the majority of people think Pride and Prejudice and the movies, not necessarily the book, who’s bicentennial of it’s publication we are celebrating this month. Miss Austen, however, wrote several other works, including an epistolary novel in the 1790s. Like the majority of authors nowadays, Austen faced rejection and publishers who did not fulfill their promises. One of Austen’s biographers, Claire Tomalin, writes of Lady Susan, “in letters, it is as neatly plotted as a play, and as cynical in tone as any of the most outrageous of the Restoration dramatists who may have provided some of her inspiration … It stands alone in Austen’s work as a study of an adult woman whose intelligence and force of character are greater than those of anyone she encounters.” This is impressive when one considers she was less than twenty years old. In 1811, Sense and Sensibility was published, though she probably began it much earlier. We don’t know if the original story known as Elinor and Marianne, which she read to her family in the 1790s, survived in this novel. Still in the 1790s, Austen attempted a third novel, which was a satire of the popular Gothic novel. That manuscript, which we know as Northanger Abbey, ended up the first one for which she received any money. Her father attempted to get her published, but that manuscript, First Impressions, later published as Pride and Prejudice, was rejected. But in 1803, a London publisher paid Austen ten pounds for the copyright on Northanger Abbey. It was not published until Austen bought back the copyright more than ten years later. After the family moved to Bath, she may have suffered from a depression that kept her from writing, or she may have revised her already created works. We aren’t certain. We do know she worked on The Watsons, but never finished it after her father died. Her own situation as an unmarried woman without independent means, closely reflected the ladies in the story. Finally, in 1811, Sense and Sensibility was published and well-received, nearly twenty years after we believe she began work on her first novel. Pride and Prejudice was published in 1813, which we are celebrating this month as it is her most famous work today. Mansfield Park was her best selling novel and published in 1814. Reviewers ignored it, but the public did not. 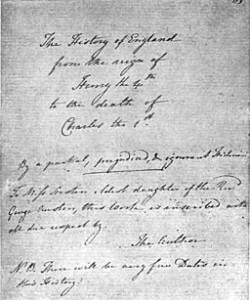 Although the books were published anonymously, and I’ve always been told that no one knew who wrote the books, I scarcely think this is true, at least for those able to worm information from perhaps the publisher, as the Prince Regent’s librarian invited her to visit and she was given the suggestion that she dedicate Emma to him in 1815. She didn’t like him, but she couldn’t refuse. This was her last book published during her lifetime. 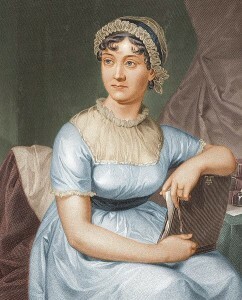 After her death, Persuasion and Northanger Abbey were published as a set in 1817. Sanditon was published, though unfinished, in 1825. Her books remained out of print until a set of her works were published in 1833. They have been in print ever since. 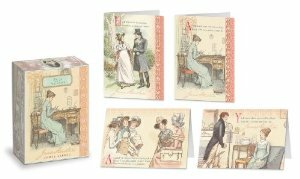 This week we’re giving away a lovely set of Jane Austen notecards. For a chance to win, please leave a comment on any of the posts this week. winner will be drawn Monday, August 12. Winner must have a mailing address within the United States.